Our blog hop begins with our Guest Designer, Mandy. 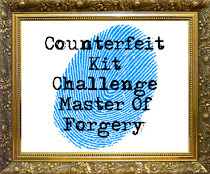 It is an exciting opportunity to be showcased at Counterfeit Kit Challenge, so please be sure to start with her blog here and work your way around. You won't want to miss any of the creative takes on this month's inspiration kit. The complete list of Master Forgers is listed below. Speaking of this month's inspiration kit, we're off to a new month with an interesting kit to counterfeit. Scraptastic's Chasing Pavement, as shown below, is a graphic combination of blue and green. It took me a while to decide how I wanted to interpret it. Since I've started counterfeiting, I've pretty much tried to match each element piece by piece, substituting as needed, but this month I thought it may be time to break that pattern. While I didn't set out to match papers from the kit, I did notice I had some similar ones in my stash. The speech bubble sheet mimics the navy blue chalk doodles piece in the inspiration kit, while the peacock paper is a natural substitute for the feather piece in the add-on kit. It wouldn't be preppy without some argyles! And those ancient Scenic Route arrows were a must. I just scored those green Varsity letter stickers by Thickers in a grab bag from one of the deal a day sites. They immediately made the cut for this month's kit. More of that Target washi tape...this month in solid green, solid blue and green polka dot. Some grosgrain ribbon and daisies in my boat shoes round out the choices to give my layouts that preppy feel. It looks like I'm all ready to flip my collar up and outfit some sweet, preppy layouts. Be sure to check back throughout the month to see my creations. How will you be inspired to counterfeit this kit? Show us what you create by linking up your "knock-off" to the February Mr. Linky (found in the sidebar at the Counterfeit Kit blog.) Check out all the Master Forgers' versions of "Chasing Pavements" by following the links below. Your next stop will be Milissa. P.S. I created an add-on kit as well, but I'll wait to share that with you later in the month. If you saw my post detailing my Counterfeit Kit "Lingering Season" earlier this month, you know how much I dread letting go of the holidays. While my Christmas oriented kit is still out, I did manage to take down almost all of my Christmas decorations. I did leave the little white candlestick lights in the windows - they just add a warm glow to the cold, dark winter and I also kept the wreath and topiaries on my mantle. They seem more wintery with snowy owls, skates and snowflakes than just exclusively Christmas. This year I made a cookie called, "Angel Face" cookies. Since the theme for this cookie exchange was highlighting your signature style, I thought this was perfect since I'm pretty much a "by the book" sort of gal and (little known fact) I was voted "Class Angel" in high school. Yes, go ahead...call me goodie two shoes or basically a geek, but it's just who I am and I was ok with it then and now! So when I saw the angel cookie cutter in my bin, I knew I had an idea cooking (or baking, in this case). I'm not a master of misting, by any means, but I'm pretty happy with the way this turned out. I made my own mist using those little misting bottles and some acrylic paint diluted with water. I would have preferred a more misted look rather than those larger dots, but I especially like the white space or glow that was left around the angel. I finished it off with some glimmer mist, which really can only be seen in person, but does add that angelic, heavenly feel. I won't even get into how wonky this page is...even after sitting under several heavy books all week! It was fun to add those little speech bubbles (made from my Cricut...something I hardly ever use!) And even though I have a variety of very busy patterns going on, it all seems to work. I'm not sure how, but I think it does! Thanks for stopping by and be sure to say hello in the comments below. Even better, click the "Follow" button to the right to keep on top of all my scrappy endeavors. 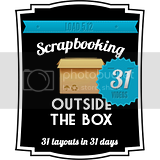 Welcome to the LOAD 213 "Scrap Happier" Blog Hop! If you've arrived here from Christy's blog, then you are on the right track. If you've just stumbled in, be sure to check out the complete list of bloggers below so that you can make the rounds. We're having a LOAD pep rally of sorts to gear up for a month-long journey to scrapbooking happiness. So grab a cuppa of whatever makes you happiest and read on. By now most of you know that I am a LOAD believer. pose for pictures with her LOAD branded gear? LOAD, Lain Ehmann's Layout A Day scrapbook challenge, is sort of like a pilgrimage to completed pages. It is an opportunity to push aside the housework and other chores, guilt, perfectionism, and indecision and keep holy the scrap table. It can loosely be compared to the waiting, preparing, and sacrificing that sometimes comes before some major religious holidays. While not a religious experience, LOAD does provide some great opportunities for introspection, gratitude and praise. And just like any challenge or sacrifice, if you put in the time and effort, the reward will be yours in the end. Here are some basic beliefs I have about the Layout A Day Challenge. strengthen you as a scrapbooker. Remember practice makes per...oh yeah, we don't use that word around here! Whether it's your design skills, storytelling, or even your overall confidence, you WILL improve! help you appreciate the little things in life. The prompts will help you take inventory of what is really important. Now, don't worry...Lain has a way of mixing in the veggies with the mashed potatoes so you won't even know you are digging deep. I've ended up with some pages I never thought I would ever create and I'm absolutely thrilled with them. force you to act fast, make decisions and trust your instincts. It is the perfect elixir for procrastination. put a huge dent in your stash. And you know what that means? That's right! The chance to pick up some brand new CHA stuff! give you the opportunity for fellowship with other people passionate about scrapbooking. The gallery is a perfect place to employ the "Do Unto Others" motto. Leave feedback for others and it will come back to you. It's wonderfully encouraging and fun! It is sooo worth the time. ultimately make you a happier person. How, you ask? Well, the feeling of accomplishment at the end of the month, the stack of completed pages with images and stories documented, the friends you will make (and yes, I can't believe how many wonderful online friends I have made!) will all contribute to a stronger sense of self and a greater appreciation of life. Wow...those are powerful words, but I have to tell you, it's that good. It's hard to not be a believer when you consider these facts. If you are currently signed up for LOAD, I look forward to taking this pilgrimage with you. If you're not signed up yet, take a leap of faith and trust me on this one. Click the LOAD213 icon in the sidebar to see if you can snag one of the last few spots available. It has truly been a life changing experience and one which has contributed to my happiness. I'm quite certain in the end that you'll be a believer, too. Be sure to check out the rest of our pep rally. Your next stop is Julie. Lynnette Nagle: http://sassyscrapper2010.blogspot.com/ YOU ARE HERE! Welcome to the Your Story Matters e-book blog hop. You should have arrived her via Paivi. If not, check the list below to be sure you catch all of our participants. Looking for inspiration? Looking for ways to document the little things in life? Look no further! Read on and find out how you can get your hands on this fantastic e-book resource with contributions by the Scrap Happy community under the direction of Lain Ehmann and Dani Taylor. My assignment was to complete a layout about my first car. My Big Brown Buick. It wasn't a cool or sporty car, as you can see, not even back in 1984! It had belonged to my sister-in-law's retired aunt, but this 7 year old sedan was generously given to me gratis...provided I pay for the insurance. It was my ticket to freedom, and sporty or not, I gratefully accepted the gift. As for creating the layout, I decided I wanted to keep a monochromatic look. Cars aren't really brown these days and emphasizing that does help to drive home the outdated "first car" feel (either that or it horribly dates me!) I found the papers in Echo Park's, "Note to Self" paper pack perfect. The arrows and spirograph looking paper seemed to fit the car theme. And as a side note, this car had horrible brakes and terrible traction. It would spin out with even the slightest amount of rain and forget about ice! So, that spirograph paper has even MORE significance! As for the tire track paper, I just broke out one of my son's matchbox cars, rolled it around in my ink pad and did some "donuts" on some kraft paper! The finishing touches included a Studio Calico wood veneer car, a Cosmo Cricket wood tone arrow and a sticker from the "Note to Self" pack that I fashioned with a red arrow to look like a speedometer. A pretty well-appointed layout, don't you think? 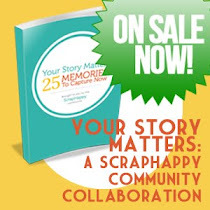 And while Your Story Matters was originally available exclusively to Scrap Happy members, it is now available to the general public for an introductory price of $7 via instant download. Use the coupon code HOP and receive $2 off the purchase price. Offer valid until midnight on 1/21/13. Just follow the link below to purchase a resource that is fully loaded with inspiration! We will be giving away THREE copies of the book from comments made on ALL blogs participating in this hop. 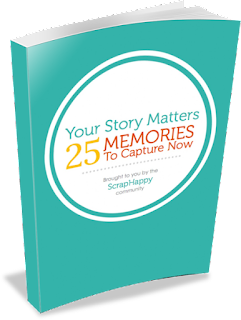 Leave a comment telling me what story is critical for every scrapbooker to document by 1/19/13 for a chance to win. Winners will be announced on the Layout A Day blog on Monday, 1/21/13. Prizes must be claimed by Wednesday, 1/23/13. Lynnette Nagle: sassyscrapper2010.blogspot.com YOU ARE HERE! And see...I didn't even try to sell you the undercoating! Do you remember coloring on Shrinky Dinks as a child and making little plastic charms? How about we use the same material in crafting some flair-ish type buttons with an icy, snowy feel. Come on...I'll show you how. I had some shrink plastic from long ago in my stash, but also noticed it is sold in the stamping supply aisle as the Shrinky Dink brand in my local Michael's, in case you don't have any on hand. I used a 3 inch punch to cut out a circle. Remember, your image will shrink by about 50% once heat set, so consider how large you'd like your finished piece to be. Using a fine grit sandpaper, I sanded the side where I wanted to put the image. I thought I may have had a snowflake stamp in my stash, but no such luck. I also knew I would need a special kind of ink (like Stayz On) if I wanted to stamp on the shrink plastic, and I knew I didn't have anything other than black. In the spirit of using what you have on hand, I experimented using my Uni Ball white gel pen and drew the snowflakes free hand. Since doodling and drawing aren't my forte, I used Google images and searched for "hand drawn snowflakes" and used that as my guide. There, that wasn't too hard. If you'd like to thread your flair with twine (or in my case, tinsel), you'll want to hole punch before shrinking. As I child, I recall putting my Shrinky Dinks in the oven, but I discovered online that your heat tool (like the kind used for embossing) will also do that job and give you greater control during the plastic transformation. You'll want to be sure to have something to keep the "dink" in place while you are shrinking. I used a metal skewer. I also used a non-stick frying pan since the heat gun does make the surface hot. I had to stop mid-way to take a picture as I was doing this solo, but you'll want to keep the skewer lightly on your piece or it WILL become a hot flying piece of plastic! It will bend and curl and almost seem like a lost cause, but just keep applying the heat and use your skewer to help it become flat again. Total shrinking time is less than a minute. I used something hard and flat (like this canister cover) to flatten out my flair as soon as I turned off the heat. Next, let's add a little bling to our icy flakes. Some silver and diamond Stickles should do the job. A little tinsel from my January Counterfeit Kit, "Lingering Season" and I'm ready to add my flair to a scrapbook page. Had enough of snow and ice? No problem. Get out your shrink plastic and make your flair suit your fancy.